This table helps you calculate each way place odds in decimal format. We don’t provide the odds for under 4.0 (3/1) as we would not advise betting on these horses each way. 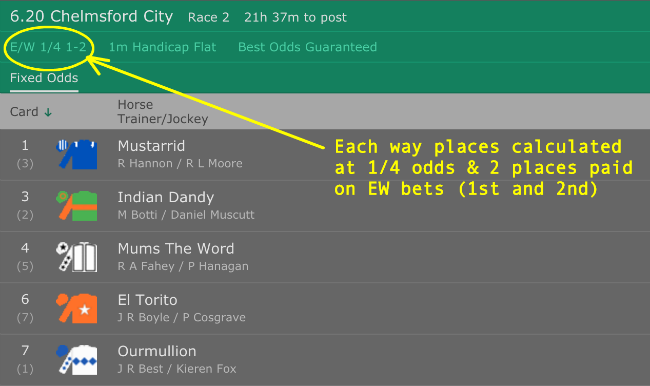 It may make your account stand out too much – after all, if your horse did place at these odds or less then it would still lose you money overall. In fact, this is true for any horse under the odds of 5.0 for 1/4 odds races and under odds of 6.0 for 1/5 odds races. This means that the each way ‘place’ odds for the race are calculated at 1/4. It also shows that places 1 and 2 in the race qualify for the ‘place’ parts in this race. In big horse racing events like Cheltenham Festival, you will typically find that there are 3-to-5 places paid. This depends on how many horses there are in the race and also if any promotions are running. In the Grand National at Royal Ascot, you may even find some bookmakers offering 6, 7 or even 8 places paid. This is great for matched bettors as we can exploit the extra places in an attempt to hit a big win.